Digital marketers know that most blog posts have a short life span. Even if you’re sending them to your email subscribers, most blog posts experience the bulk of their traffic in the first 24 to 48 hours. But how can you use social media to maximize the long-term impact of your blog content? Through the process of social distribution, your blog post can live a long, happy life. This process not only notifies social connections as soon as a post is published but also ensures that the post continues to cycle through your social feeds for days, weeks, and months afterward. Splintering your content is the process of breaking off bits and pieces of it and posting those pieces a là carte. When a piece of content is published and ready for sharing, you have all the source material needed to splinter shareable content for social media posts. You can splinter headlines, quotes, images, questions, and statistics found in your content and distribute them across your social media channels. Visual content is necessary to drive engagement and clicks on social media. Buffer, a software application company designed to manage accounts on social networks, saw an 18 percent increase of clicks, 89 percent increase in favorites, and 150 percent increase in retweets by using images, which goes to show that you’re leaving a lot of distribution reach on the table if you don’t incorporate images into your social strategy. The feature image (which usually appears at the top of your blog posts) is typically the first visual asset that you should share on social media channels. But one image isn’t enough; you need to create a visual asset for every splinter. Quote images, a visual device with a simple picture and a standalone quote, for example, are perfect for Facebook and Twitter. Don’t think you’re hindered if you can’t afford a graphic designer. Canva is a free tool for creating images that you can share on social networks. Just make sure that your images fall within your social media channel’s guidelines. 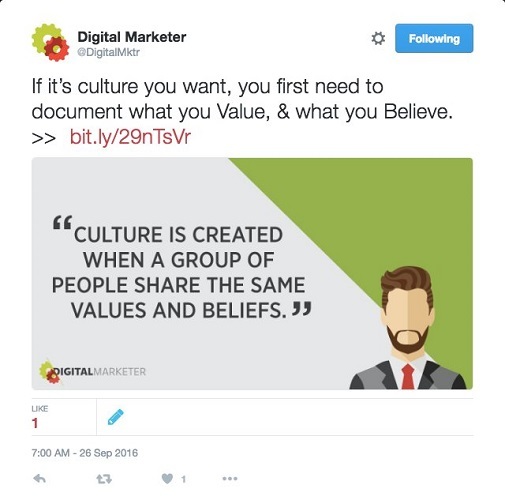 This image shows a quote from a DigitalMarketer blog post that was turned into a quote image and then tweeted on Twitter. Using a quote from a blog post and turning it into a visual tweet. After creating your splinters and visual assets, you need to broadcast your content on your social media channels. Focus your copy on the benefits and point of the article, and maintain a consistent personality and tone on your pages whenever possible. Then, how do you address your audience on your social channels? Do you usually address your audience in a light-hearted, bantering way, or do you typically use more serious and direct language? Appeal to your audience by maintaining that tone in your social media updates. Tweet 1 — Title: Simply tweet the title of the blog post and a link to the blog post. Tweet 2 — Quote: Splinter a quote from the blog post and tweet it, followed by a link to the blog post. Tweet 3 — Question: Ask a question that the blog post will answer in this tweet and, as always, include a link to the blog post. When broadcasting a post, tag people and brands whenever it makes sense. You can tag the author or any companies and brands mentioned in your blog as you create the copy for your social media update. By doing so, you drive traffic to your post and draw attention from your social influencers and their followers. Also, use hashtags wherever appropriate — particularly on networks like Twitter. A hashtag is a simple way for people to search for tweets with a common topic. 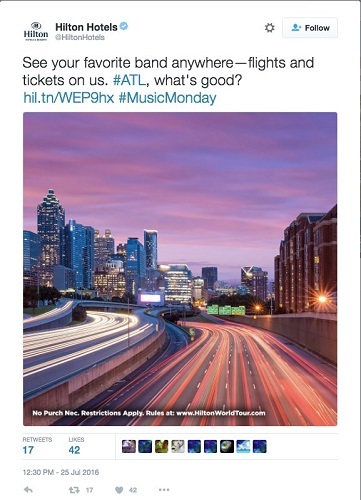 This image shows Hilton Hotels tweeting a contest with the hashtag #ATL (for Atlanta, Georgia) and #MusicMonday. Anyone who monitors these hashtags or topics has a chance to see these tweets. Hilton promotes a contest by using hashtags. Most of the social media action occurs in the first 24 to 48 hours of a blog post’s life. During this time, you need to monitor the performance of that blog post on the social web. One tool you can use for this monitoring is a URL shortener called Bitly. URL shorteners like Bitly create shorter links that are easier to remember and, more important, provide analytics. For example, Bitly reports on who’s clicking from what channel, where people share your content, and which broadcast and social media platform performed the best. It can also tell you what time your post performed at its peak, where in the world your content is reaching, and even which tweets performed best so that you can determine the best copy for your audience on Twitter. 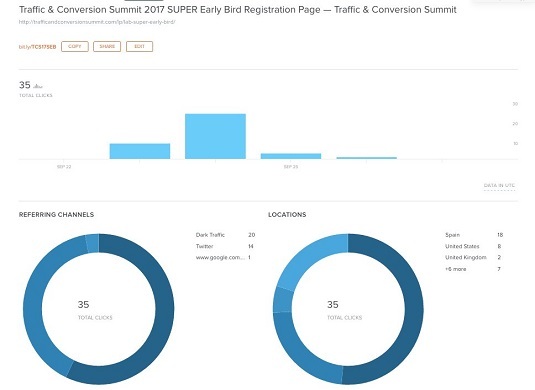 Here, you see the reporting dashboard available for a Bitly link. Reporting data on a link from Bitly. A normal, undistributed piece of content usually creates a spike in clicks before it vanishes off the face of the social earth. That’s why long-term automated distribution (or scheduling) is necessary. Scheduling your content into a social media management tool results in perpetual sharing and content distribution with no action needed from you after loading it into your library. Tools like Edgar are perfect for scheduling and automation across Twitter and LinkedIn. Edgar allows you to make categories and choose what time content publishes using those categories. Then the library randomizes itself and posts content in rotation so that you’re not bombarding your audience with the same tweets day after day. Keep in mind that when you’re broadcasting your content, you already have everything you need to schedule. After you’ve set up your three broadcasting tweets the first day your content is published, take those same tweets and load them into a tool like Edgar. Doing so puts your tweets into automated rotation and keeps social traffic flowing to your blog posts.